The Chichester Chamber Concert presentation on Thursday 8th November in the Chichester Assembly Room was one of variety, enjoyment and exquisite musicianship. 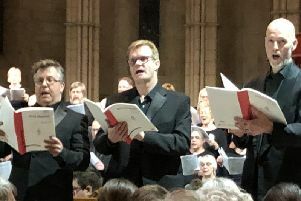 The performers were the highly accomplished Merlin Ensemble Vienna comprising Martin Walch (violin), Hubert Renner (horn) and Till Alexander Körber (piano). Martin Walch, who is also the director of the ensemble, enlivened the proceedings with his interesting and highly amusing comments on the works included in the programme. They began with the Sonata No 2 in A major for piano and violin Op.100 by Brahms. Known as the Thun sonata after the Swiss resort where it was composed, the second sonatas is both relatively short and technically difficult. Brahms gave the sonata the formal title Sonata for Piano and Violin, indicating that the piano part is to be regarded as being as important as that of the violin. Martin Walch and Till Alexander Körber gave us a well-balanced performance of great delicacy and sensitivity, Walch producing lovely tone quality from his instrument, particularly in the lower register. The Brahms was followed by a novelty; Richard Strauss’s tone poem Till Eulenspiegels lustige Streiche Op.28 – Till Eulensiegel’s Merry Pranks – arranged for violin, horn and piano by the evening’s pianist Till Alexander Körber. The reduction of great works for small chamber combinations has precedent to bring them into the reach of smaller venues and societies. Till Eulenspiegel is certainly a big work and is scored for a huge orchestra. It has previously been arranged for four hands and was even presented as a ballet by Nijinsky in 1916. Arrangement for an ensemble including the horn is entirely appropriate since Till’s theme is articulated on the horn in the original orchestration but in this version I did rather miss the sarcastic voice of the E flat clarinet. Nevertheless this was a charming, rumbustious performance much enjoyed by the large audience. After this, the Merlin Ensemble introduced an un-programmed item, a Brahms Scherzo for violin and piano. This was a movement from a collaborative four movement work by three composers, Brahms, Schumann and Albert Dietrich, written in Düsseldorf in October 1853 as a gift and tribute to the great virtuoso violinist Joachim. It is known as the “FAE Sonata” standing for Frei aber einsam (free but lonely) a motto adopted by Joachim. Joachim gave the first performance, correctly guessing the composer of each of the movements. The Scherzo was not published until 1906, ten years after Brahms’s death. It is vigorous and exciting and the Merlin’s performance was suitable virtuosic and energetic. After the interval there were two more works for violin and piano; La Lugubre Gondola by Liszt and the Mephisto Waltz, also by Liszt and arranged by Till Alexander Körber. La Lugubre Gondola, depicting a Venetian funeral gondola, was suitably solemn and Martin Walch again produced glorious rich tone from the lower strings of his violin. The Mephisto Waltz, also arranged by Till Alexander Körber, allowed both players to fully demonstrate their virtuosity. Hubert Renner returned to the platform to join his colleagues in the most substantial work of the second half, Brahms’s Horn trio in E flat Op.40. Written in Spring 1865 shortly after the death of Brahms’s mother, the trio has an air of melancholic nostalgia; the third movement – sympathetically rendered in this performance - bears the funereal marking Adagio mesto and includes a direct quote from an old German funeral chorale. But the work is enlivened by hunting songs in the second and fourth movements and the overall mood is far from solemn. This was a most enjoyable interpretation by the Merlin Ensemble culminating in a jolly romp to the work’s final moments. We were treated to no less than three encores: a movement from a trio composed for the Ensemble by Till Alexander Körber, a truncated recapitulation of Till Eulenspiegel and, to conclude, and with a nod towards the forthcoming Remembrance commemorations, a moving rendition by Martin Walch and Till Alexander Körber of Elgar’s Salut d’Amour. This rounded off a delightful and rewarding evening of quality musicianship.